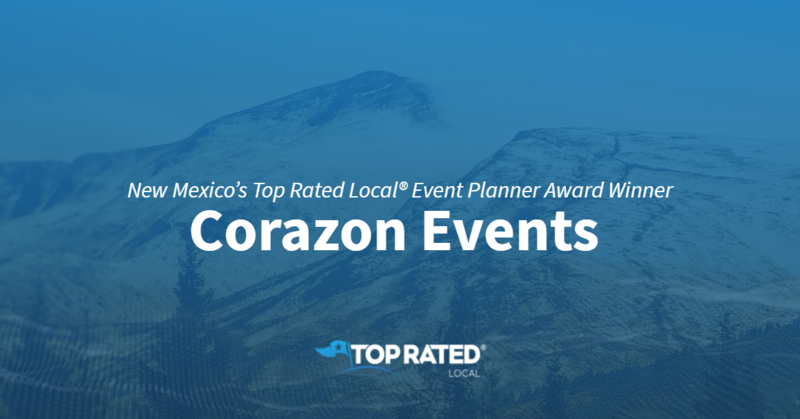 Top Rated Local® is pleased to announce that Corazon Events is not only the number one event planning service in New Mexico, but one of the top 25 businesses in that state overall for 2019! “The skill, professionalism, and diplomacy exhibited by Camilla and the Corazon Events team during the planning and execution of my daughter’s Bat Mitzvah was beyond compare. Our unique family dynamic presented many challenges that Camilla navigated with tact and aplomb. Her emails and communications were always polite and professional. Throughout the process, Camilla remained forthright and impartial; expressing her opinions succinctly and articulately. Camilla ably accommodated the demands of various headstrong individuals, all while incorporating a myriad of different styles and tastes into a seamless confluence of imaginatively themed media. Needless to say, the events themselves were carried out to perfection. The catering, room layout, and timeline were precise and well organized. The elegant flowers and decorations created a lively, fun, and festive atmosphere. It was a very special night for me and my family. I am grateful to Corazon Events for making it happen.” -Josh R.
We got a chance to speak with Camilla Dominguez, the owner of Corazon Events, about her business’ sensational online reputation. Thank you for speaking with us, Camilla! Congratulations to the team at Corazon Events for being a 2019 Top Rated Local award winner!